The UV-Vis spectrophotometer is used for measuring of light absorption in ultraviolet and visible range of spectra, from 190–800 nm. 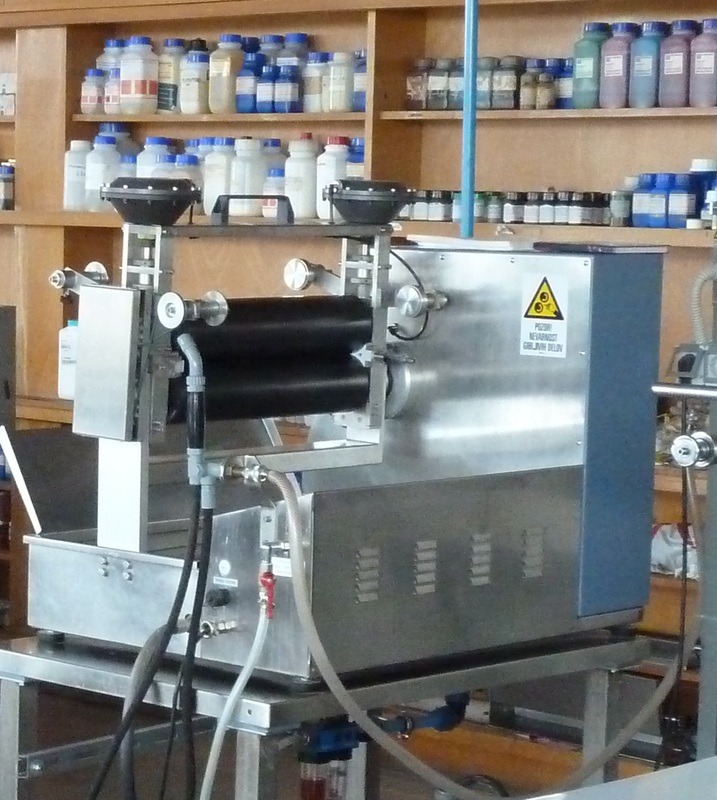 It is used for concentration determination of dye or other substances concentration, for observation of reaction kinetics and for observation of dye bath exhaustion. 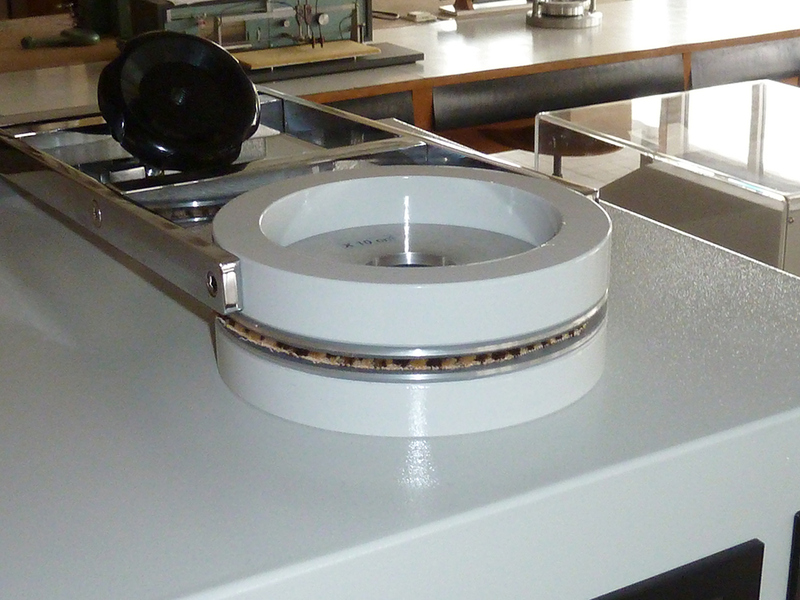 With the integrating sphere, measurements of transmission and reflectance are also possible on flat samples. These parameters give us useful information when we are interested in sun protection characteristics of textiles. *Vat not included; work of technician not included in prices. The TOC analyser enables us to determine the amount of total organic carbon according to the international standard (ISO 8245). The TOC value is one of the important ecologic parameters with which we can estimate the rate of wastewater burden. Concentration of TOC in mg/l can be calculated as the difference between the value of total carbon (TC) and the value of inorganic carbon (IC). Each parameter is determined from calibration curves from the amount of CO2, detected by the IR detector. 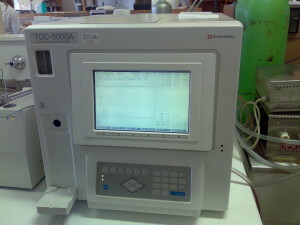 detection range: 4 ppb – 4000 ppm. 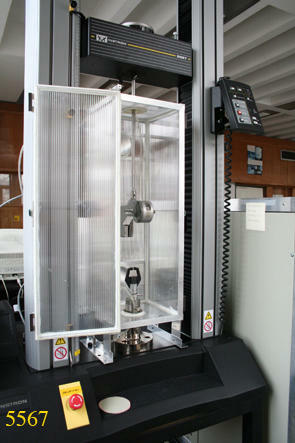 Air-Tronic is an electronic instrument to determine the air permeability, i.e. 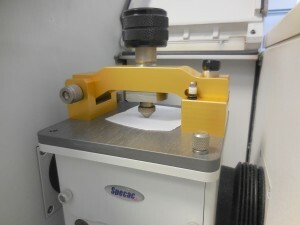 speed of the air flow that passes vertically through the sample under preset and known testing conditions. It is used for woven, knitted and non-woven fabrics, industrial fabrics for technical use, artificial leather, felt, velvet and paper. 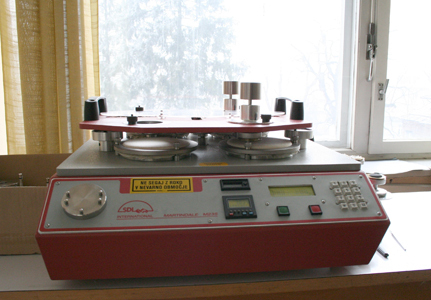 The instrument is equipped with a printer. The dynamic mechanical analyser or DMA has equipment that mechanically causes deformation of the sample made of various materials and measures its response. The so caused deformation may be sinusoid, constant, graduated or with constant speed. Twenty different parameters as measurements of responses can be monitored as a function of temperature and time. 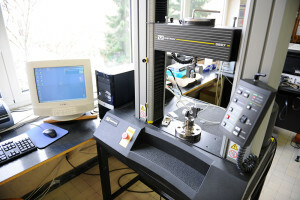 The DMA experimental technique provides measurements of mechanical viscoelastic properties of various materials. Many materials including fibres and other polymers respond as elastic solid matters and viscous liquids and that is why they have viscoelastic properties. Practical examples: measurements of Tg and secondary transitions , effect on frequency of modulus and Tg, effect of fillings, additives and adhesives, influence of technological processes, stabilities of dimensions, creep, relaxation tension, thermal mechanics, prediction of material response in a wide frequency range and time. 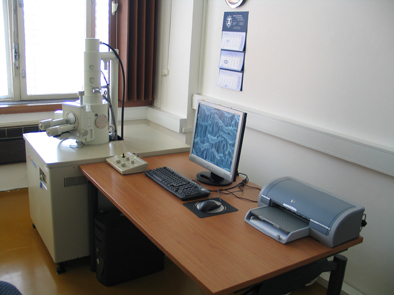 The equipment is available upon agreement on Snežniška street 5, in 3. floor, laboratory 314. Access time is dependent on equipment use. Reservation and information: barbara.golja@ntf.uni-lj.si. The tensile testing machine enables the measurements of tensile properties of different materials (textiles, paper, board, polymeric materials). Measurements can be analysed with a computer program BlueHill, which is designed for such measurements and enables us indirect insight into inner changes and occurrences in material structures as a consequence of tensile testing. With this program, it is also possible to interpret measured results later. 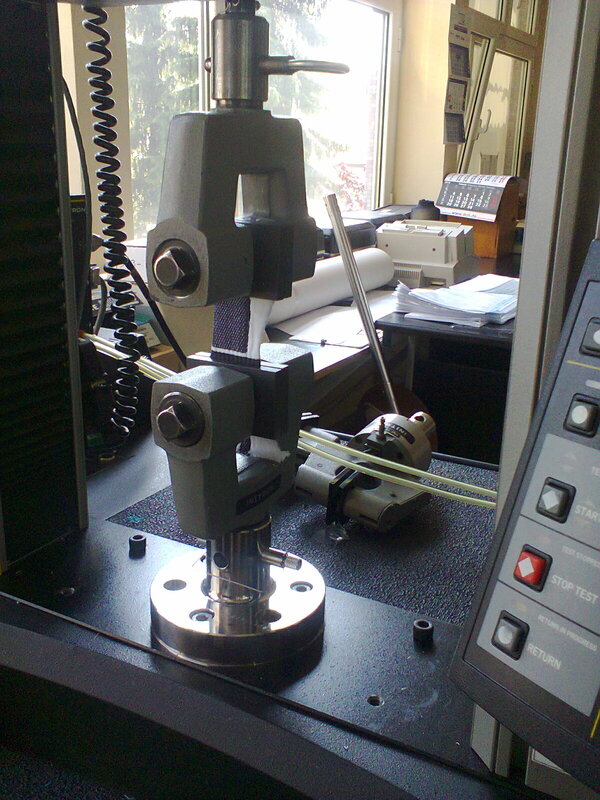 Besides tensile tests, it is possible to perform tests of compression, bending, etc. 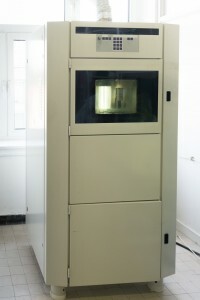 The machine includes a climate chamber with temperature range between 20°C and 80°C and relative humidity between 30 % and 80 % and a chamber with a temperature range between -70 °C and +250°C. 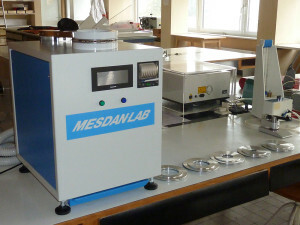 Equipment is available upon agreement on Snežniška street 5, 3rd floor, Preizkuševališče (laboratory 301); access time is dependent on equipment use. Reservation and information: barbara.golja@ntf.uni-lj.si. The FT-IR spectrometer includes FT-IR spectrometer “Spectrum GX I” and FT-IR microscope Avtoimage. 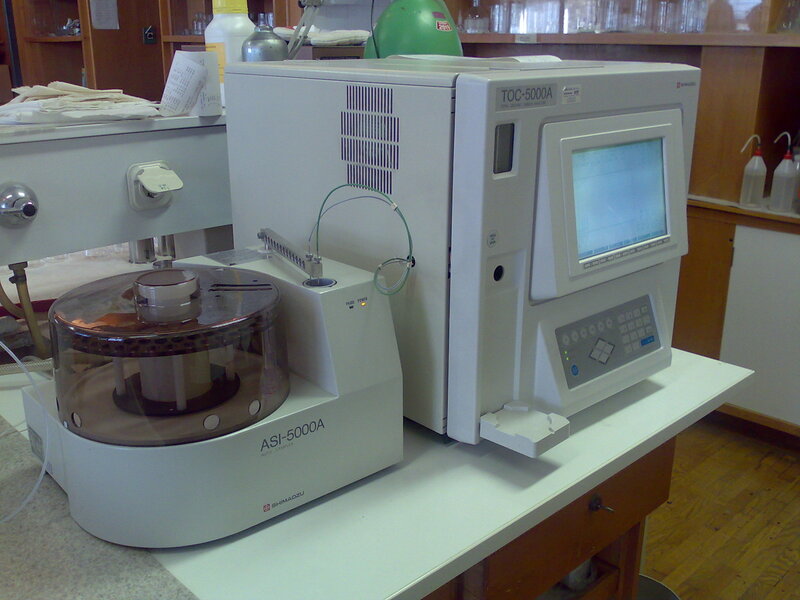 Infrared spectroscopy is a non-destructive analytical technique that enables us to identify the chemical and partially the physical structure of substances (identification of functional groups in molecules). 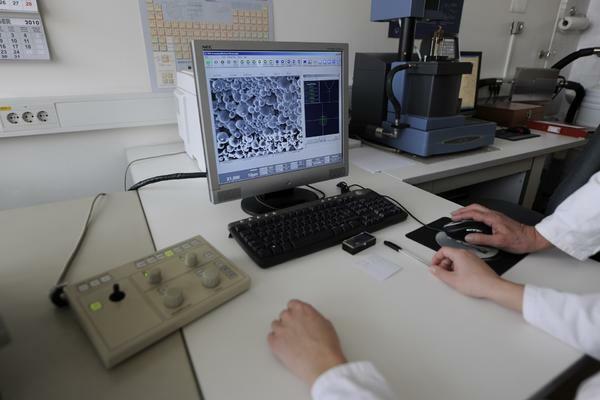 With the FT-IR spectrometer and the microscope, qualitative and to some extent quantitative analyses of unknown materials can be made; various modifications made by treatments can be monitored. 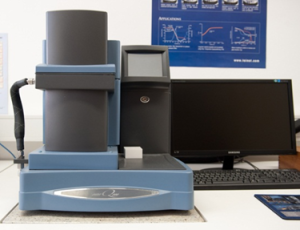 It is appropriate for analysis of mainly organic materials, such as liquids, solutions, pastes, powders, thin films, coatings, fibres, papers, prints, colours, etc… It enables use of ATR and transmission methods of IR scanning in a range of 4000–500 cm-1. 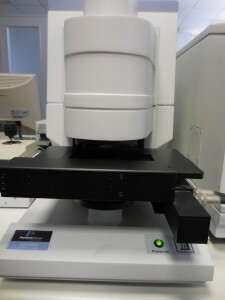 Operation of the apparatus is controlled through Spectrum and Image software for the FT-IR and microscope respectively. 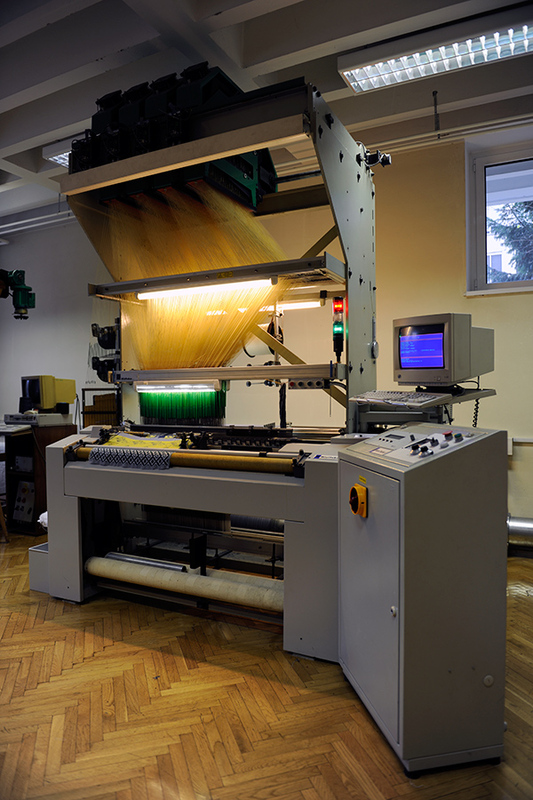 Equipment is available upon agreement on Snežniška street 5, 3rd floor; access time is dependent on equipment use. Reservation and information: barbara.golja@ntf.uni-lj.si. 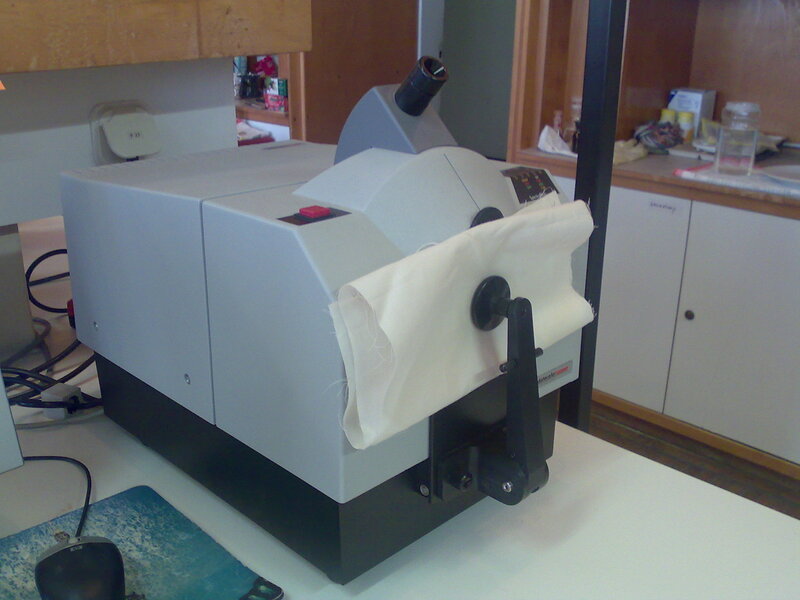 Gyrowash 815 is a testing instrument for evaluating colour fastness to washing, dry cleaning and chlorinated water, staining potential and durability of fabrics under accelerated wash conditions, according to European and American standards: AATCC Test Method 61; EN 20105 C01 – C05; ISO 105 C06, C08, C09, C10, C12, D01, E03, X05; ISO 11643; M&S; FTMS; NEXT TM and WOOLMARK TM. 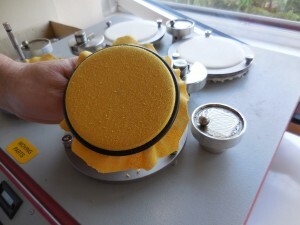 Unlike the vessels of most other wash-wheels, no conversion parts or securing bars are required for fixing them on the rotor. Instead, all the test vessels incorporate a Push and Twist feature that enables the operator to effortlessly and rapidly remove and replace them on the rotor. 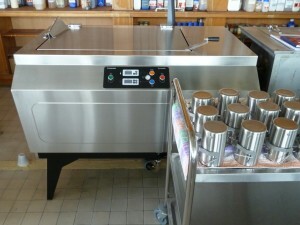 Price for 1 wash (1 dirt, 1 powder, 1 temperature), which also includes the processing of the results, is 10.00 € (excluding VAT). The laboratory jet-dyeing machine JFL is a combination of dying machine and apparatus where both the material and the dye bath are in motion. 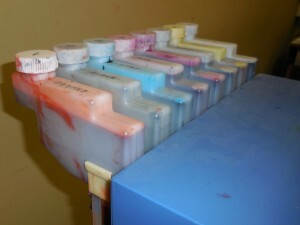 The dyeing procedure can be controlled manually or by programming. It enables good reproductive ability of dyeing procedures. On the laboratory padder, various modern finishing processes can be driven. 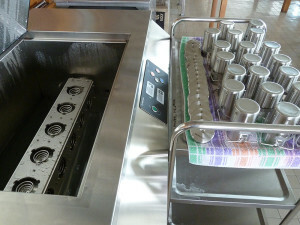 Material is soaked into the finishing bath in finishing bed on both sides and then squeezed between squeezing cylinders. Finishing can be done in horizontal or vertical position and gives the padder multifunctional usability. 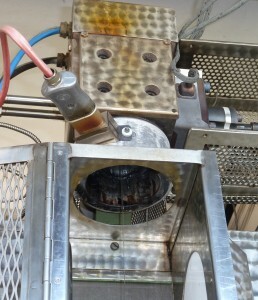 The material can be connected to the drying machine and in that way the process can be continuous. 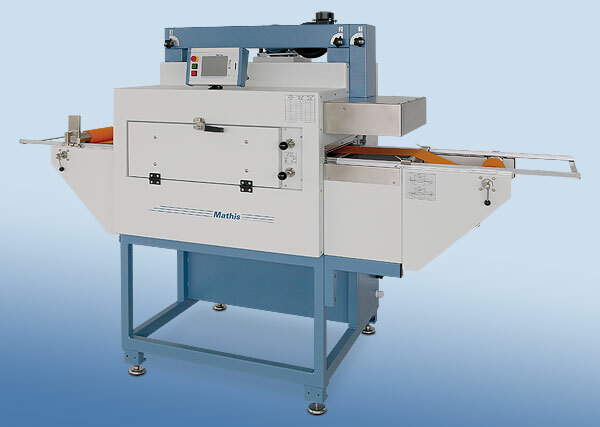 Martindale wear and abrasion tester was designed for measuring of resistance on friction of flat materials, such as knitted fabrics, nonwovens and laminated or coated textiles. 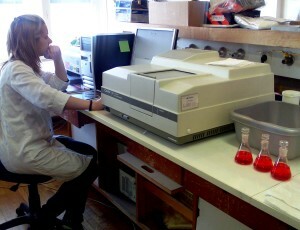 Tendency of samples to pilling is also possible. 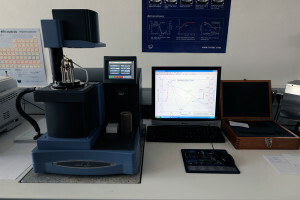 During the analysis, the sample is exposed to controlled friction to standard fabric at relatively low pressure and constantly changing direction of measuring heads movement. SES122RT is a four-bed highly productive flat knitting machine with multiple transfer capability that enables shaping and integral knitting through the use of inside narrowing of various kinds of stitches. 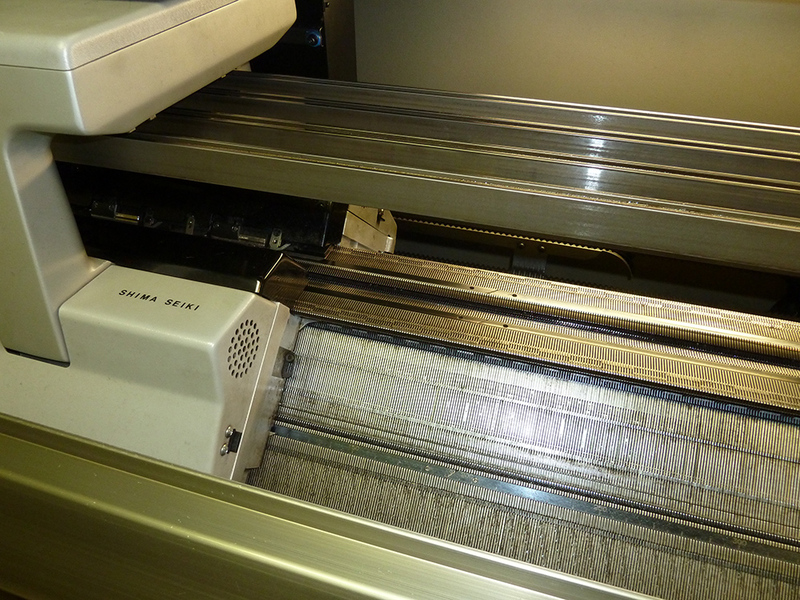 The machine has individual full jacquard needle selection for production of knitted designs with big repeats. 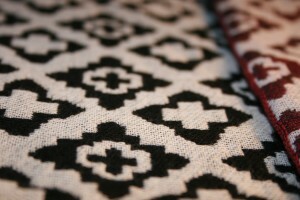 The machine is equipped with intarsia feeders that ensure additional patterning options. The machine gauge 12E enables knitting of fine yarns. Maximum carriage speed in 1.2 m/s. 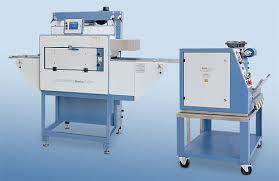 Stitch density is electronically controlled and can be adjusted in 60 levels. 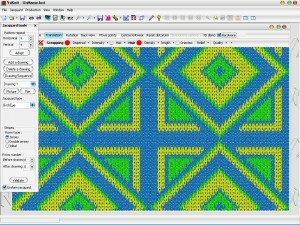 Machine control and pattern design are supported by SDS design station. The Wohlenberg 76 is a professional cutting machine for cutting paper, boards and other sheet materials both in stacks or single units. 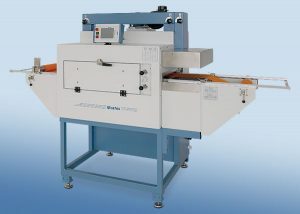 The cutting width is 760 mm and the maximum possible feed is 110 mm. 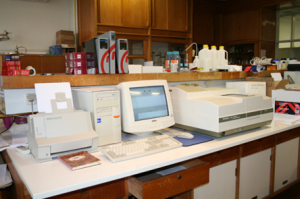 The spectrophotometer Spectraflash 600 PLUS is a two beam spectrophotometer for measuring of reflectance in visible spectra with a step of 10 nm. Instrument includes integrating sphere of radius 152 mm, which assures standard geometry of illumination d/8. Specular can be included or excluded. Light source is a pulsative xenon lamp, which in combination with different filters enables different standard lights (D65, A, F02, F50 and F55). 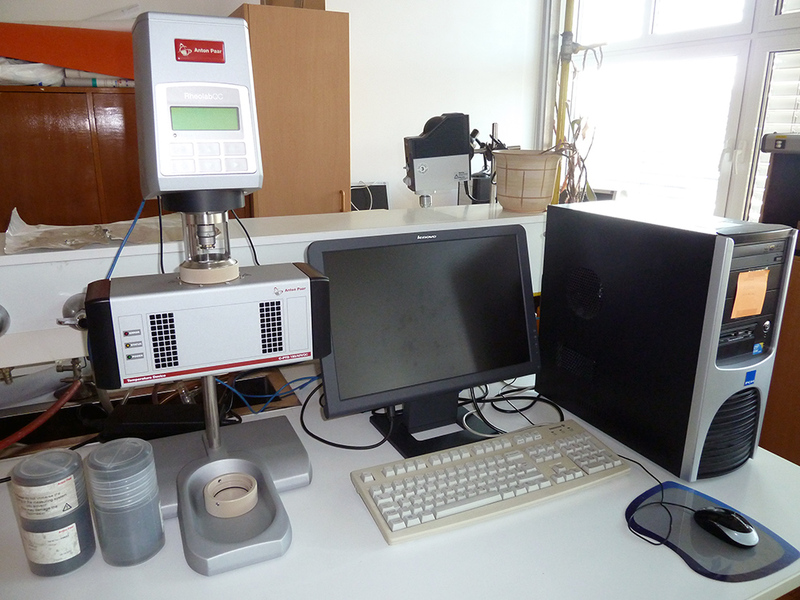 It can be used for colour coordinates measurements according to standard EN-ISO 105-J01, calculation of standardized colour values and coordinates in different colour systems. 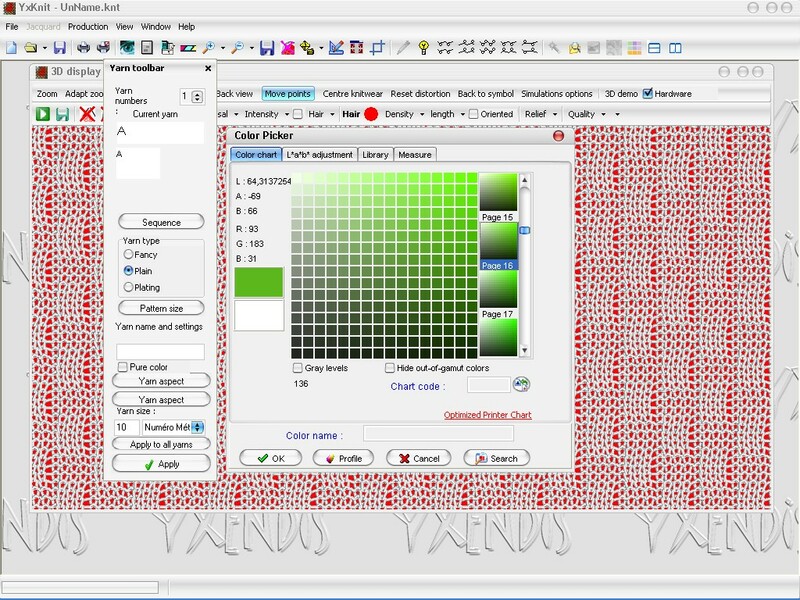 Its software enables calculation of colour differences or whiteness degrees according to different equations. 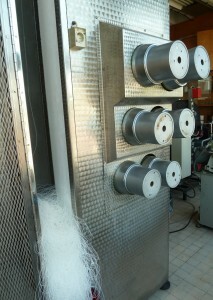 The weaving machine is electronically driven. It is designed for weaving of simple and sophisticated fabrics. It is equipped with electronic Jacquard TIS with four modules consisting of 276 hooks. 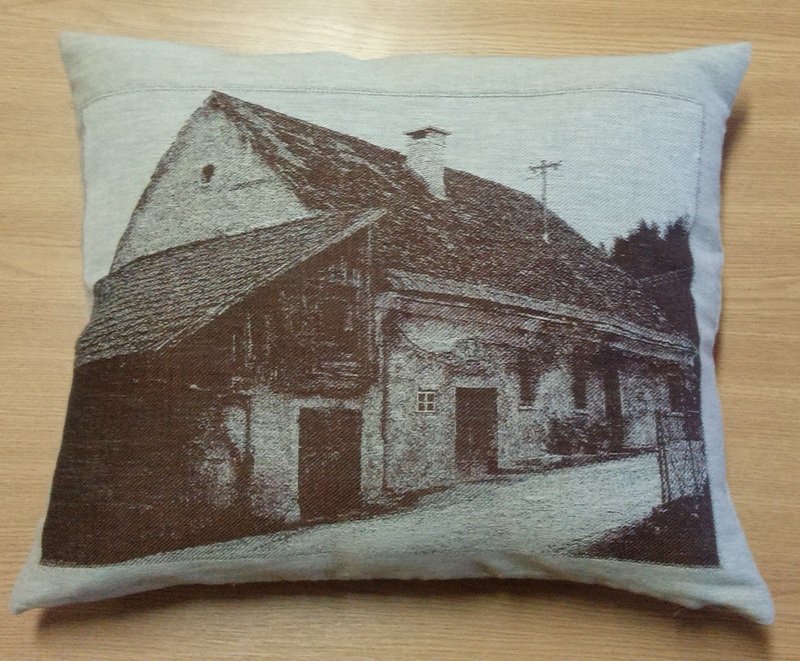 The design is supported with the computer program CAD/CAM. 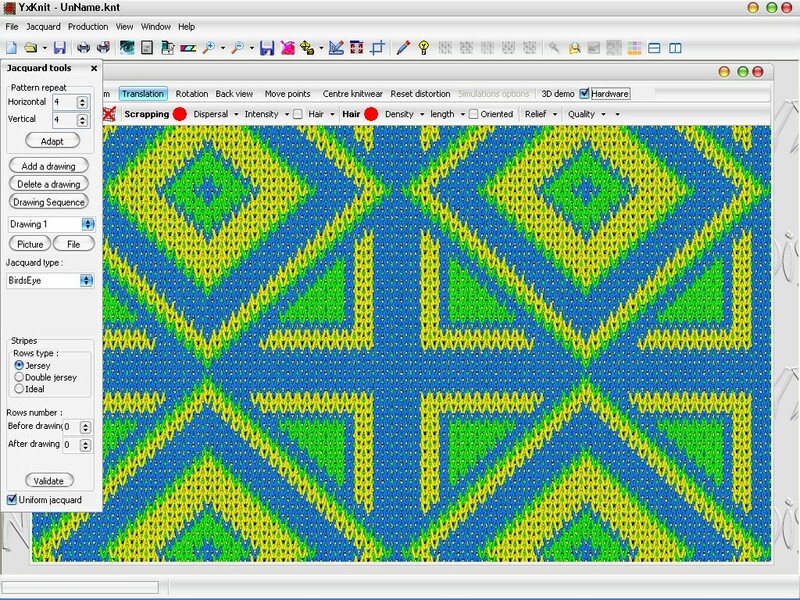 It consists of three programs ArahPaint for sample design, ArahWeave for fabric simulation in actual density and ArahDrape for 3D presentation of fabric on the object. Tobii X120 Eye Trackers is a stand-alone eye tracking unit designed for eye tracking studies of real-world flat surfaces or scenes such as physical objects, projections and video screens. Tobii X120 enables studies requiring specific stimuli setups, such as studies of shopping shelves, typography, webpages, newspapers or television. Note: Use of equipment without an operator is not possible. 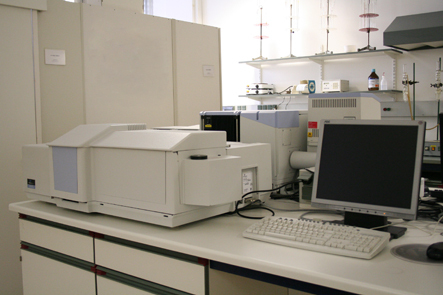 The UV/Vis spectrophotometer Lambda 800 was designed to measure transmittance and reflectance of solid samples, liquids and powders. It includes integrating sphere PELA-1000, which consists of two hemispheres and the interior of which is made of Spectralon. This special material enables strong diffuse reflection in a spectral range from 250-2500nm. 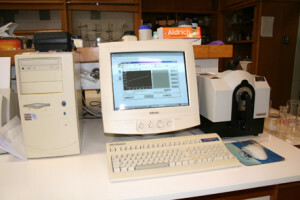 The computer program UVWinLab Software enables measurements and analysis of data. 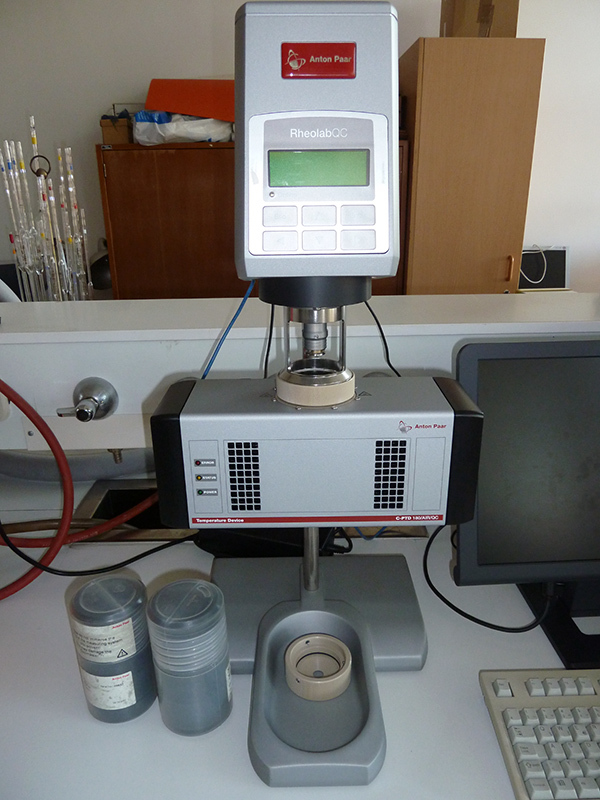 Rheolab QC is a rotational rheometer and is used for viscosity measurement and rheological properties of liquids. Test measurements can be driven either by controlling shear rate or shear stress. 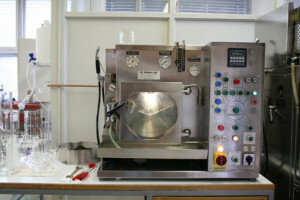 It enables viscosity curves preparation, investigations into the mixing and stirring behaviour of emulsions and dispersions as well as determination of the yield point of gels and pastes. The instrument is designed for surface, morphology and topography studies as well as for determination of particle size. 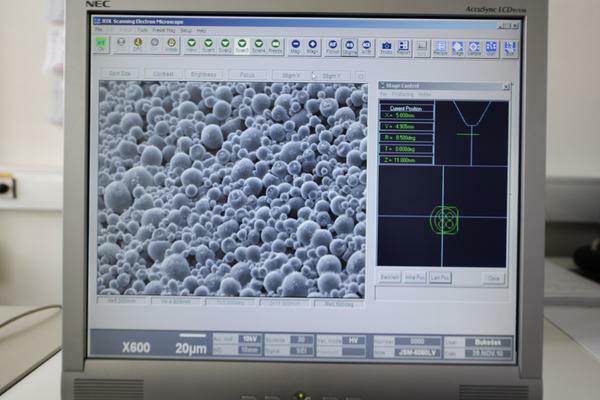 SEM image is made by secondary electrons, which are bit out of the sample by the primary beam that is scanning the surface point by point. Nonconductable materials are to be preliminarily coated with gold, which prevents static charge on the surface. It includes: electrical gun, magnification unit, image generator, condensation and objective lenses, electron collector and vacuum system. Samples of great value can be observed without coating in a low vacuum mode. 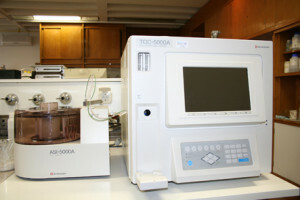 The Xenotest Alpha is an instrument for finding out the effect of light and other weather conditions on the material. 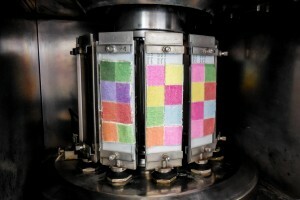 The samples are exposed to exact conditions (temperature, relative humidity, illumination, with or without rain). With such accelerated simulation of these parameters, the properties of the material after a longer period of time can be predicted. With the use of different filters, exposure to direct sunlight, behind window glass or behind car glass can be simulated. These test methods can be driven according to international standards used for textiles, papers and plastics (SIST ISO 105-B02, SIST ISO 105-B04, SIST ISO 105-B06, SIST ISO 12040, ISO 4892, ISO 11341). 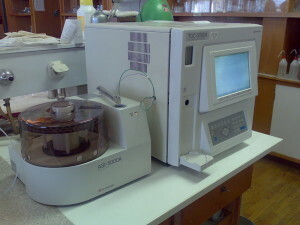 The equipment is available upon agreement; access time is dependent on equipment use. Reservation and information: barbara.golja@ntf.uni-lj.si. 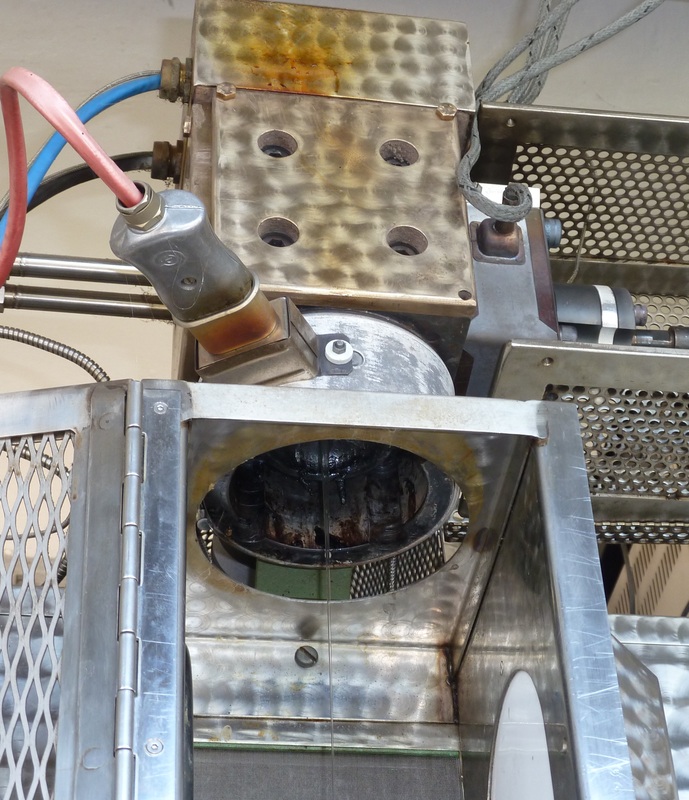 The laboratory melt spinning device is designed for the production of synthetic filament yarns in the melt spinning process. 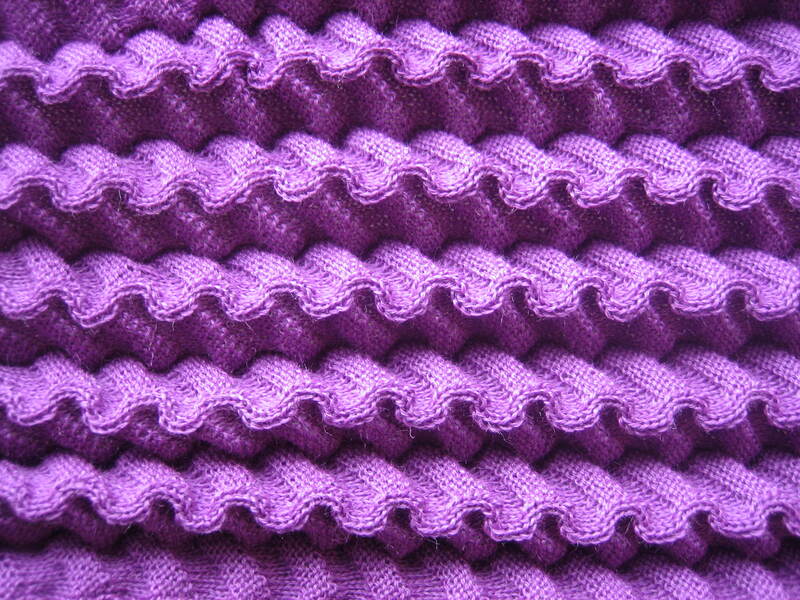 Synthetic filament yarns of different synthetic polymers with the melting point under 300 °C can be formed i.e. : PE, PP, PA 6, PA 66, PET, PLA etc. The advantage of the laboratory melt spinning device is in its laboratory size as allows the production of filament yarns from a very small amount of the polymer. 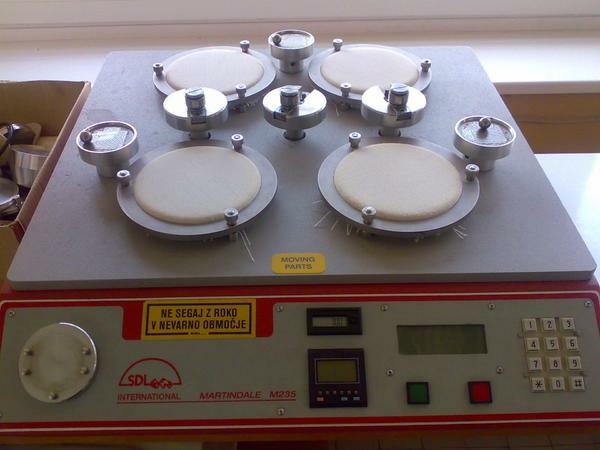 Research on the laboratory-spinning machine is oriented towards the use of new polymers and additives. The digital printer Textile Jet Tx2-1600 is designed to print textiles. 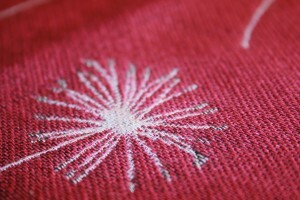 It works on the principle DOD (drop on demand), with a drop of dye formed only where this is dictated by the pattern. It is possible to print eight different colours at high speeds. 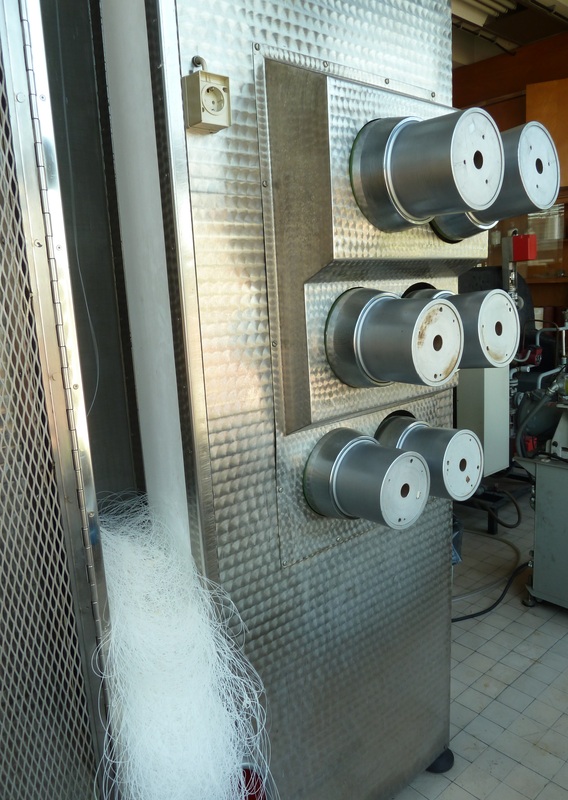 Depending on the composition of the dye printing of textile materials with different fibre compositions is possible. 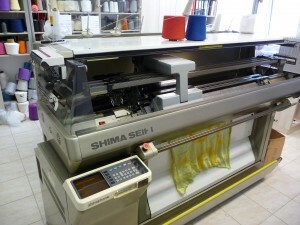 The printer has reactive dyes installed, which are suitable for printing of cotton, wool, silk and viscose. The fabric should be finished with all necessary chemicals before printing and stored in the roll. 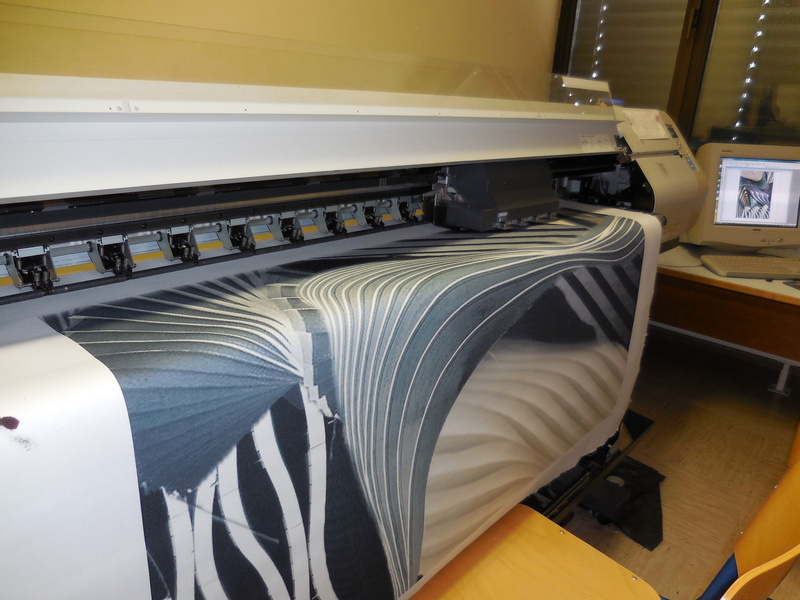 It is possible to print fabrics and knitted fabrics, if they do not wrinkle or shrink. Printing can be made on either side. 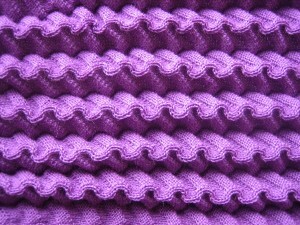 The thickness of fabric should be between 0.1 and 7 mm. 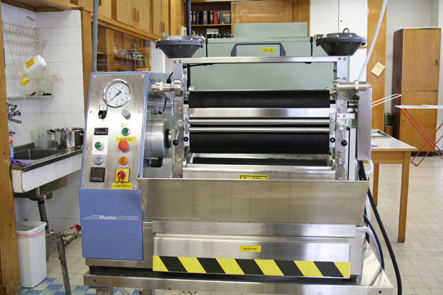 Fabric size (in a roll): outside diameter to 180 mm, roll weight to 15 kg. Spectrophotometer is used for colour measuring according to the standard ISO 13655:2009. The instrument i1Pro 2 is also used for profiling input devices (digital camera, scanner), display devices (projector, monitor) and output devices (digital printer, printing machine). 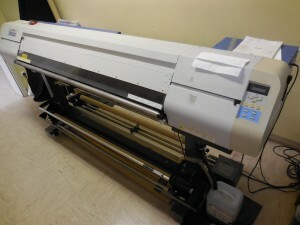 The equipment is located on Chair of Information and Graphic Technology, Snežniška ulica 5, on the 3. floor, and is available upon agreement. Capture and analysis of digital data of topology of a physical object for the production of a digital 3D model. 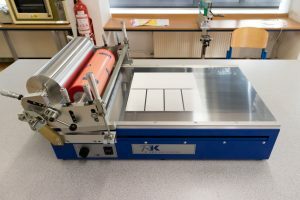 The equipment is located on Chair of Information and Graphic Technology, Snežniška ulica 5, on the ground floor, and is available upon agreement. 3D printer CubePro Duo is designed for printing of conceptual and functional prototypes based on thermoplastic materials with two printing heads. 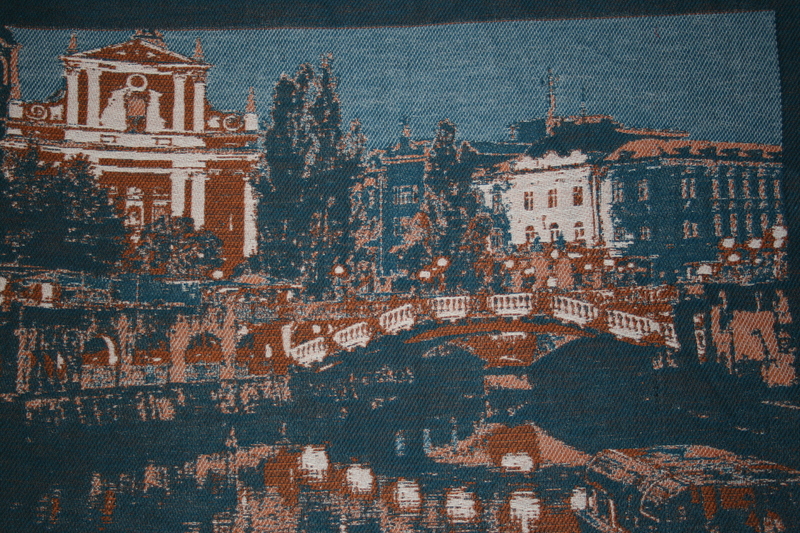 Working area: 24,29 x 23 x 27,04 cm, layer resolution: 70 – 300 µm, nozzle diameter 0,4 mm. 3D printer Makerbot Mini is designed for printing of conceptual and functional prototypes of smaller dimensions based on thermoplastic materials. Working area: 10,1 cm x 12,6 cm x 12,6 cm, layer resolution: 100 – 400 µm, nozzle diameter 0,4 mm. 3D printer Form 2 is designed for printing of conceptual and functional prototypes based on stereolithography (SLA). Zmorph 2.0 SX is an open source 3D printer, designed for printing of conceptual and functional prototypes based on thermoplastic materials with different printing heads. 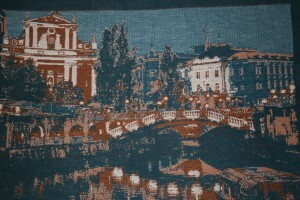 Working area: 250 x 235 x 165 mm, layer resolution: 40 – 400 µm, nozzle diameter: 0,3 in 0,4 mm. 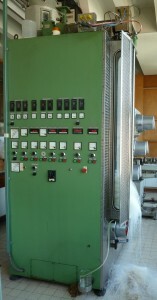 Laboratory coating unit for paper, cardboard and flat textiles coating: coated area 350 x 440 mm. 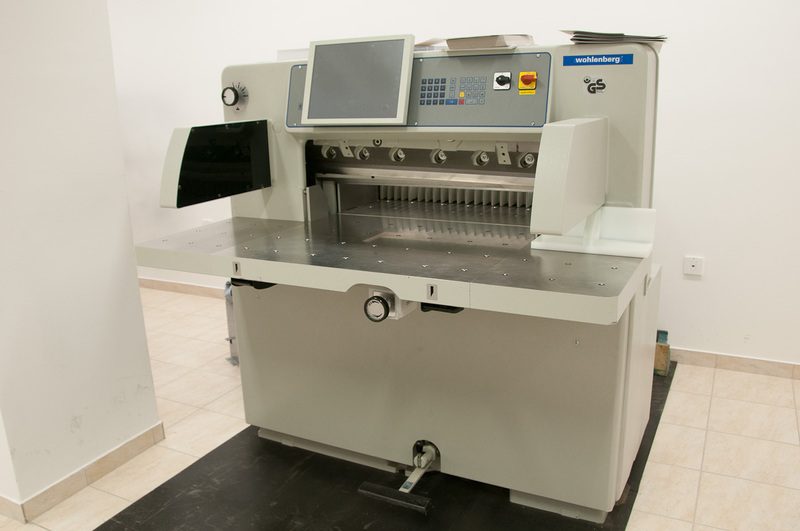 Equipped with the gravure printing head and flexo printing head for laboratory printing trials. The equipment is available upon agreement.